The caretakers in this photo were skulking in the shadows dressed in colour-coordinated long robes and turbans, as if playing bit parts in some period movie. I was immediately taken by their lined faces, full of character, and by the fact that slanting light was coming down from the ceiling and illuminating them like biblical figures. They sat on rickety wooden chairs and spent the time shouting “No flash! No flash!” at visitors, or alternatively, “Who flash? Who flash?” when a flash went off. They were guarding two exquisite small rooms inside the Temple of Horus covered in wall paintings depicting the pharaohs and gods. The colours are delicate and fading, though you can still see the washed-out greens and reds of 2,000 years ago. 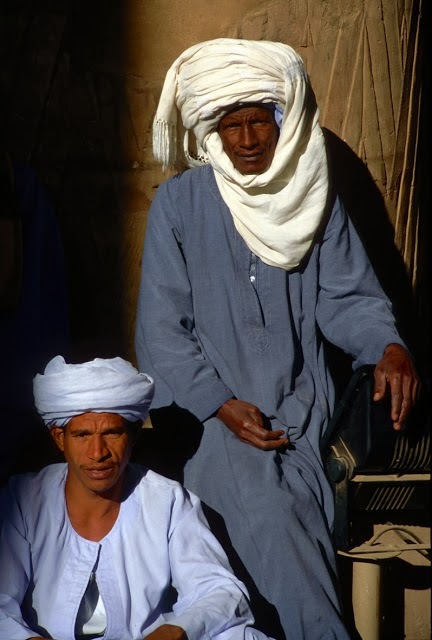 The caretakers didn’t seem to mind being photographed and, remarkably, didn’t even ask for baksheesh. 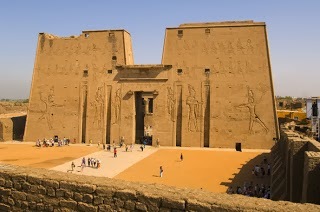 Temple of Horus, Edfu, Egypt. Edfu is a bustling little centre for sugar and pottery production on the banks of the Nile north of Luxor. It’s a stopover for river-cruise ships plying the Nile between Luxor and Aswan, and one that's a Captain Rivers favourite. As tourists disembark, touts go into overdrive, hawking mini obelisks and cats and masks of Tutankhamen. Calash drivers prod their horses into action: “Temple of Horus! Twenty pounds sir! Come, come!” and off you clip-clop. 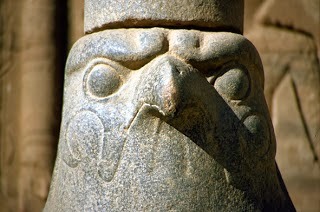 If you’ve been to the Temple of Horus and feel you have something to add, please do so. Our readers appreciate your comments or memories.